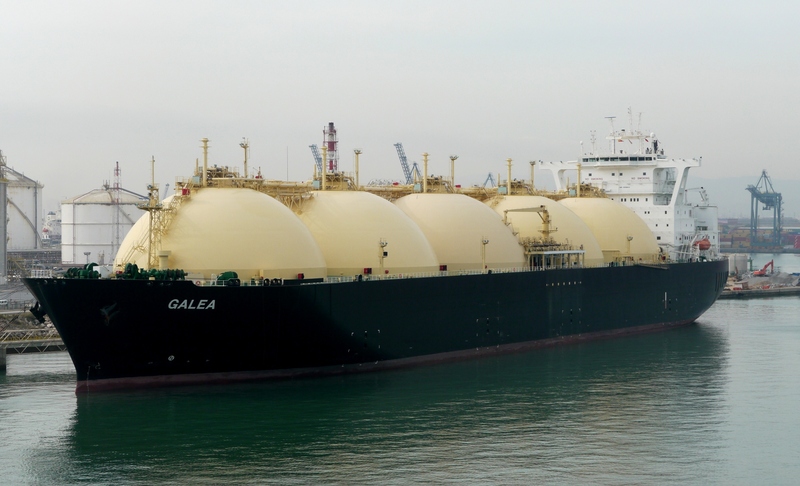 Liquefied natural gas (LNG) is natural gas under the big pressure that is refrigerated to a very low temperatures so it acquires liquid aggregate state. When natural gas is cooled all the way to 161 degrees of Celsius below zero, it becomes clear liquid without color, taste and smell. Since LNG takes only 1/600 of natural gas volume when in gaseous state, that state is suitable for tanker transportation across the world. Terminal for LNG is installation for filling and emptying tankers which are transporting that energent. 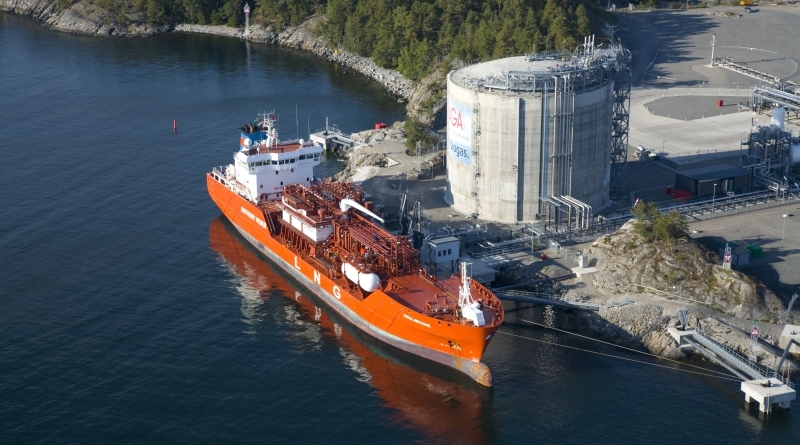 Tankers that transport LNG can be longer than 300 meters, and minimal water depth must be more than 12 meters, when they’re being completely full. These tankers must also have double lining and are specially designed to withstand low LNG temperatures. Largest LNG terminal in USA. Sited in Maryland, south of Baltimore. 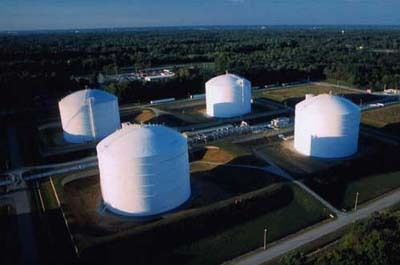 LNG reception started in 2003. After its reception in terminal, LNG is normally transported to isolated containers constructed specially for LNG saving. These containers must maintain low liquid temperature and must minimize quantity of the exhaled gas. Temperature inside container will remain unchanged if the pressure is regulated with the gas steam emission. 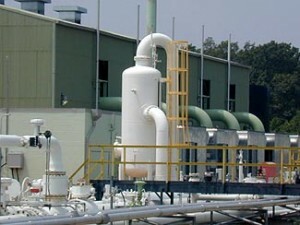 Emmisioned gas can be collected and used as the fuel in installation for trans-shipment and collection of LNG. Tankers that are transporting LNG can use this emissioned gas as a fuel. Although gas containers can be on surface as well, most often are used as the underground containers which must satisfy two basic characteristics: they must maintain LNG for future use and must have good gas transmission system (ventils, compressors, …). 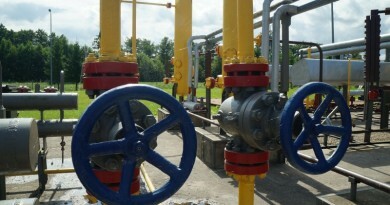 Natural gas is often stored in LNG shape and in distant installations, not just on terminals. Before use LNG must be transformed back to gaseous state. This picture shows installation for LNG’s transformation in to a gaseous state. 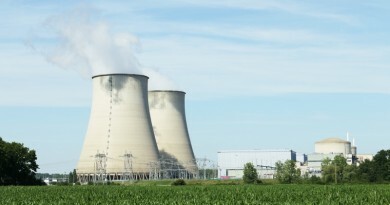 Before LNG’s energy can be exploited, it’s necessary to heat it in order to become useable for cooking, heating and electrical energy production. On the right picture you can see installation for LNG transformation back to gaseous state. Largest exporters of liquefied natural gas are naturally countries which have largest reserves of this gas. These are Algeria, Australia, Indonesia, Lybia, Malaysia, Nigeria, Oman and Katar. At this moment, there are 40 LNG terminals in the world intended for gas reception. LNG’s are momentarily importing Japan, South Korea, USA and few European countries. European countries having LNG terminals are Portugal, Spain, France, Belgium, Italy, Greece and one terminal is built in European part of Turkey as well. Risks when handling with LNG are coming from its three characteristics: dispersion, inflammability and extremely low temperature’s products. Extremely cold LNG can inflict direct consequences and cause wounds or damages. Steam cloud that turns up upon effusion can if carried with wind get at inhabited areas, and if there’s a gas concentration in this steam between five and 15 percent then this steam is very easy inflammable. 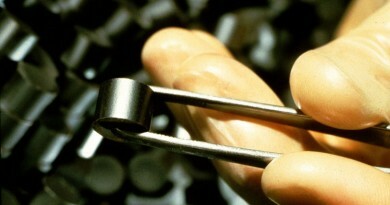 Fire that resulted from this process is giving extremely high temperatures. Good side of LNG exhalation is the fact that it heats itself and that steam rises in air (created gas steam is easier than the air). LNG isn’t inflammable all by itself and statements in sense of: “LNG tankers are sailing bombs” are not correct, because LNG is not inflammable so it cannot explode. Proof for this are many incidents that happened (major LNG leakage, damages as the result of the bad weather, sea collisions), and still in all these incidents tanker with all its content never exploded. In purpose of promoting understanding of LNG safety, many modeling of possible disasters have been made. For instance, modeling of catastrophic outpouring from one tanker container which has 25.000 cubic meters of LNG has been made. Time till full combustion according to results of the modeling was 37 minutes in case that hole in container is five meter long, and 64 minutes if hole’s one meter long. In case of one meter hole and wind with speed of 1.5 m/s, lower inflammability border would be remote 4 kilometers from container, and in case of the wind with speed of 5 m/s that border would be only about one kilometer. Lower border of inflammability is the gas concentration of five percent (gas burns only in concentrations between 5 and 15 %). Bigger speed of wind enables faster mixing of surrounding air and gas, which makes lower border of inflammability to be closer to its source, although at first sight we’d think that bigger wind speed means larger distance of lower inflammability border from its source. If gas gets inflamed in big quantities, it is calculated that on distance of 300 meters and in time period of 60 seconds, conditions will become so hot that people will start to feel pain. Ships that are transporting LNG can be even longer than 300 meters. When being full, minimum water depth must be 12 meters for normal sail. Terrorism or deliberate provocation of effusion and inflammation of gas is at this moment the most likely scenario of possible big disaster. Because of this problem America has strictly set the rules that are determining sail with tankers full of LNG. Fast ships are following tanker and protecting it when it sails to terminal and upon cargo unloading. When in sail, tanker cannot be approached by another ship on the distance of 450 meters from each side and 3.2 kilometers in front and behind the ship. For the offenders higher convictions are determined (up to ten years of imprisonment), but that will probably not discourage suicidal terrorists to attempt to crash into a tanker. Legal regulation of the safety is a difficult thing because not even America has completely regulated laws at this moment (for instance, it isn’t completely defined what the coast guard should do if some marine vehicle sails into a safety zone around tankers), and more worrying is the fact that terrorists managed to crash themselves with the craft to a well guarded military ship USS Cole. 01.2004 – device that turns water into a steam exploded causing even greater explosion of gas cloud in Algeria. Explosion destroyed part of the LNG installation, with dead and wounded people even outside installation. 07. 2004 – pipeline between Belgium’s port Zeebrugge and northern France exploded, 23 victims. 08. 2005 – 28 inches underground pipeline exploded in Nigeria, resulting in conflagration which spread to 27 square miles.